Group Coaching Program...Coming Soon in 2016! 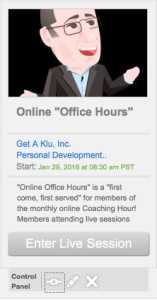 - Get A Klu, Inc.
Group Coaching Program…Coming Soon in 2016! I have never hosted a Group Coaching program. However, for the last couple years (for students in my Public Speaking Classes), I have hosted “Sunday Night Office Hours” in my Online Platform with Learn it Live. It’s kinda like Group Coaching. The format is REAL SIMPLE: Answer questions from participants and if there are no participants, cover content! Oh, and I record all the sessions so they can be viewed by any student that cannot attend “LIVE”…OH, and I also upload docs, audios, videos and powerpoints into the “Content Library” that is accessible by all participants too! 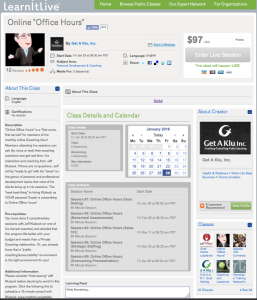 Starting Friday January 29th, 2016 at 8:30 a.m. and continuing monthly on the last Friday of every Month, I will host and record a “group” coaching session in a virtual classroom called “Online Office Hours.“ Participants can join the Monthly sessions IN REAL TIME and get specific coaching questions answered! All the sessions will be recorded and will stay “accessible” in the classroom, so even if you can’t make the live session, you can review recordings 24/7 at your leisure. I will always have a topic that I will be covering if there are no live participants with questions. Early adopters of the program will get special pricing of $97 for the first 3 months (you can sign up NOW on Learn it Live by clicking HERE). After 3 months, the price to remain in the program will convert to a monthly fee as of yet undetermined (between $35-97/month) depending on the success of the program). Current paying clients will be given a code to access the sessions for FREE. Former students will get a discounted “student rate” and everyone else will enjoy a very affordable option to enrolling in Private Coaching with me. Who should join my group coaching program? YOU WANT COACHING, but you are Busy! You don’t have time for weekly or even bi-weekly Private Sessions, but an online session once a month plus 24/7 access to recordings and the content library seems right for you! YOU WANT COACHING, but you are on a Budget! $97 a month is easier on the wallet than my current 60-minute Coaching rate of $375/hour (as of 12-2015). YOU AREN’T SURE IF YOU WANT COACHING! So, you want to get to know me and the Get A Klu coaching style before committing to a larger program. YOU WANT COMMUNITY! You love learning…ESPECIALLY learning with and from others. You enjoy “listening in” on other people getting their questions answered (like talk radio) and look forward to being a part of THIS community…a “KLU-mmunity” if you will! The topic for January will be Goal-Setting (just in time to pick up those that have fallen off their Resolutions!). In February I will cover Behavioral Assessments…March tackles “Sales 101” in a bonus mid-month session and “Strategic Staffing” will be covered in the last Friday position. In April I will cover “Procrastination” and give my best tips for overcoming this widespread disease! Please leave comments if you have topics you’d like to see covered in this program OR you can click here to schedule an appointment with Klubeck to learn more about this program if you have questions prior to joining! This entry was publish on December 22, 2015 / Jeffrey Klubeck, M.A.. Posted in Accountability, Assessments, Business Coaching, Clients, Featured, Goal Setting, Life Coaching, Resources, Webinar and tagged 24/7, group coaching, learn it live, office hours, online, webinar. Bookmark the permalink.